My friend Jun Yamaguchi is a talented artist. Around Thanksgiving of 2013, he was hanging out with my family, working on a watercolor. I was bored, and cajoled him into giving me a quick lesson. Of course the painting I made sucked, no surprise there. But what did surprise me was the fact that I enjoyed it. I don't consider myself a painter, or an artist, so maybe I was just surprised that when I put brush to paper, I ended up with something that looked vaguely like what I'd intended. I've stuck with it, and decided to post the progress I've made here. I was actually super pleased with how this recreation of a painting in a watercolor tutorial turned out. The tutorial emphasized the effects you can achieve with just a single color by varying the tone. "Valovi Chair" - A painting of a chair I actually made using a CNC machine with plans found on opendesk.cc. This was another painting I attempted based on an original in a watercolor tutorial book. I like the somber feel and muted tones in this one, and think the dead tree turned out halfway decent. A third attempt at "Two Pines". 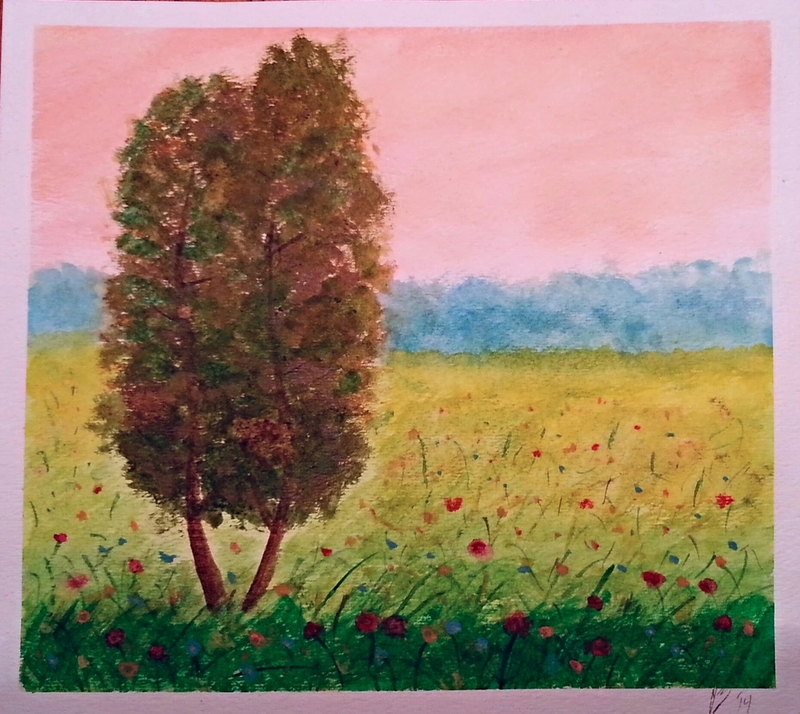 The trees turned out softer, which I'm happy about, but I don't think it was my best attempt at grass in the foreground. Second attempt at "Two Pines". Attempting this one again has helped me appreciate how finicky the 'wet on wet' technique in watercolor can be. My attempt at replicating a painting of a barn in a watercolor tutorial book. Pretty pleased with this one, although I wish the front face of the barn was a little more uniform in color. My attempt at replicating the watercolor "Two Pines" from a watercolor tutorial book I picked up. It needs work, especially in the trees. I'll probably try this one again. I was really happy with how this turned out. Except I forgot to add shadows to the trees. It was a gift for my sister. Idea came from here. Another study of tree branch structure. It ended up looking a bit too boxy, IMHO. This was an effort on my part to get better at painting the branch structure of trees. Getting the windmill blades to look right from this perspective ended up being more difficult than I'd originally expected. I'm pretty happy with the end result though! Purple flowers, shamelessly copied from something I saw on Pinterest. A painting of an airplane. (I'm kidding -- it's obviously a horse). Mountains in India (I haven't been there, so I doubt they look like this). I originally intended for this to be a tree, but now I think it's actually a hot air balloon, as seen by someone with really bad eyesight. My girlfriend, in a car, in Cleveland, in Ohio, in the United States. Boulder's flatirons, painted from a picture I took on a hike. Attempt #2 at painting a sunset. A picture of a sunset that I captured while on a bike ride in rural Ohio. A second attempt at recreating a painting my dad bought my mom in Italy. I like the colors in this one a bit better, but regret that I filled in the trees so densely that no light shines through. An attempt at recreating a painting my dad bought my mom in Italy. Boston Harbor, painted from a picture I took while working there one summer. The edge of a garage and some tree trunks, at sunset. My first attempt at painting a person (my girlfriend). Don't worry, her hand doesn't look like that in real life. Griffith Observatory, painted from a picture I took while visiting my friends Corey and Laura in LA. I asked my mom to hang this on her fridge. She said "no". This is the second thing I ever painted. It's Glacier Ridge Metro Park, mid-fall. This is the first thing I ever painted. It was supposed to be a reproduction of a blurry picture I took one evening on a drive home, of car headlights/taillights on a bridge. I went on vacation in Philadelphia in March (during a blizzard -- perfect timing), and stayed at a really charming AirBnB. I liked the look of the house, and felt that the architecture was simple enough that I could take a stab at painting it. I'd never painted brick before, and that was a bit of a challenge, but if you don't stare at it too closely, I think it looks pretty good!